Agrani Bank is going to set up a money exchange company in Malaysia next month to facilitate hassle-free remittance by Bangladeshi nationals there. Poor infrastructure, bureaucratic complexities and confrontational politics are main hindrances to foreign direct investment (FDI) in the country, speakers at a roundtable said yesterday. Wrong policy, corruption and management inefficiency have left the country's jute sector on the verge of ruin, speakers told a roundtable in Dhaka yesterday. The Supreme Court yesterday stayed for two weeks a High Court order that imposed injunction on the functioning of 18 elected directors of the Rajshahi Chamber of Commerce and Industries (RCCI). Loan volume for Asia excluding Japan rose more than 17 percent in the first half of 2005 over the same period last year, debt market news service Basis Point said. India's Punjab National Bank (PNB) is set to acquire management stake of a bank in Bangladesh, the PNB indicated at a press briefing in Kolkata on Saturday. World oil prices fell by more than a dollar on Monday after American facilities in the Gulf of Mexico escaped the impact of Hurricane Dennis, which wreaked havoc in the United States, dealers said. AZ Mohammad Hossain has been made chairman of Green Delta Insurance Co Ltd. 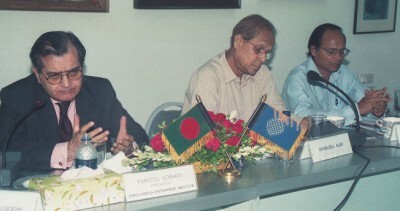 The Board of Directors of the company in a meeting recently in Dhaka elected him chairman, says a press release. Jetstar Asia said Monday it had reluctantly called off talks with rival Singapore-based budget carrier Valuair, less than two weeks after announcing the airlines had begun merger negotiations. © thedailystar.net , 2005. All Rights Reserved.